Nyepi is the name for Indonesian Hindu’s Day of Silence. The term Nyepi comes from Indonesian word ‘sepi’, means quiet, celebrated in March every year. The day is signified the new year or Isakawarsa in Saka (Çaka) Calendar, Balinese Hindu Calendar. The calendar is an adjusted lunar calendar, with an extra month to keep the calendar from lagging behind the Gregorian Calendar. Because of this, the date celebration is different for each year, but all still happen in March, similar principle with the Chinese calendar. The calendar is started in 78 AD, so this year, it will be the 1936 year of Saka. From 6 am to 6 am in the day of silence, a day of self-reflection is reserved. In this day, all Hindus need to do catur brata or four restrains. Catur brata is comprised of four principles: amati geni, amati karya, amati lelunganan, and amati lelanguan. Amati geni means abstaining from lighting fire or light. The fire or light mentioned is including electricity, so, in Nyepi, people can’t use their electronics and can’t light candles. Stove is included in this definition, so in this day, people can’t cook. Amati Karya means abstaining from work. In this day, people aren’t going to school or to work. Nyepi itself is a public holiday, so there is no need for absenting. Amati lelunganan means abstaining from traveling and amati lelanguan means fasting and abstaining from entertainment. Abled people are suggested to do tapa(suffering), brata(restraining from desire), yoga(connecting souls with God), and semadhi (unifying mind with God), resulting in cleansed body and mind. The Island of Bali is the province where most Hindus live in Indonesia. Because of this fact, in Nyepi, it will be very quiet in all around Bali. People living in Bali will also respected the day, including tourists. There will be no vehicles in sight during Nyepi, no shop open, closed beaches, even Ngurah Rai Airport will be closed. If you want to go vacationing to Bali in March and don’t want to observe Nyepi and all of it rituals (that’s actually very wonderful experience), do check the date for Nyepi and prepare beforehand, because it will halt all of your activities in Bali. There are exception, of course, for emergency situation. For life-threatening illness and sudden birth, emergency vehicles is available, and for keeping orders, Pecalang, traditional security personnels can roam on the street. 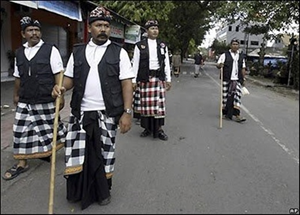 Pecalang can be easily spoted with their uniform: checkered pants, white shirt, black waistcoat and headband, accompanied by keris (dagger). The ritual for Nyepi is not limited to the day. Two or three days before Nyepi, cleansing ritual of Melasti is done. In Melasti, cleansing ritual in Pura (Hindu Temple) near the sea held for purifying sacred objects and prayer tools of temples. Sea, with its God, Baruna, is believed as the source of sacred water (tirta amerta) that can cleanse all impurities in human and nature. The Bhuta Yajna Ritual is performed to create balance between God, mankind, and nature. Pecaruan offering is made for Batara Kala (the God of Underworld) according to their abilities, Pañca Sata (small), Pañca Sanak (medium), dan Tawur Agung (big) in every levels of neigbourhood. Caru of each household is consisted of nasi manca warna (five kind of rice) for 9 tanding (packages) including the side dishes. Special in Bali, the day before Nyepi, Ogoh-Ogoh, very big statues made from paper is made to symbolize malevolent spirits. 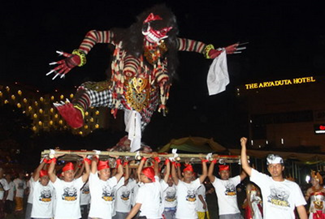 The Ogoh-Ogoh will be paraded with every street closed for the parade, and in Ngrupuk, the Ogoh-Ogoh then will be burned. Usually each communities will make their best Ogoh-Ogoh and competing for the title of the best. Ngrupuk is a ritual of spreading out rice, beating out things or kentongan (bamboo siren) to make noises, also intended to chase Batara Kala away from the neighbourhood. The Last of the rituals is the Ngembak Geni (Permitted to Light Fire) done in the day after Nyepi, second day of the Saka Year. To start the year with purity, all family and neighbourhood will do Dharma Shanti, activities of reading ancient scripts containing songs and lyrics). The principle is that everybody is the creat ion of Ida Sanghyang Widhi Wasa, loving each other and apologizing with one another for each person’s fault. Although not being celebrated as widely as in Bali, in other city, devoted Hindus will celebrate the day with Catur Brata ritual, similar with people in Bali. In Yogyakarta, the ceremony is held with Matur Piuning in four location, in Pura Jagatnatha, in Mount Merapi, Parangkusumo Beach, and Tugu Monument of Yogyakarta. Mendak Tirta, the sacred water procession is held with water from spring from Mount Merapi, Beji, parangkusumo Beach and Prambanan Temple. The Melasti or Sacred Labuhan is held in the beach. 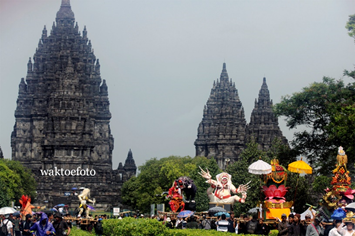 In Prambanan Temple, The Tawur Agung ceremony on the eve of Nyepi are held. The ceremony in Yogyakarta also completed with Ogoh-Ogoh made by communities and university students. 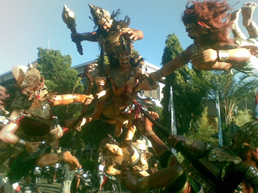 Because of the size of the ceremony, Nyepi in Yogyakarta also attract devoted Hindus from Central Java to come. Other people in East Java do the tapa brata in pura, place of worship for Hindu, such as in Jombang, where people done ritual such as Tri Sandya and Kramaning Sembah after sunrise. In a few cities in Indonesia, such as Batam, Pekanbaru of Riau, and Medan of North Sumatera, Ogoh-Ogoh parade also being held, although not as big as it is in Bali. 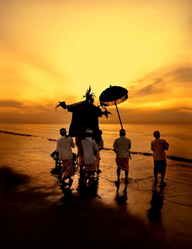 Melasti ritual is also performed at Balekambang Beach on the southern coast of Malang, East Java, named Jalani Dhipuka. Other Hindus in different areas of Indonesia also celebrating the day of silence, such as people in Sulawesi, Papua, Kalimantan, even abroad. Do you also have ceremonies for celebrating new year? Do tell us. Posted on April 2, 2014, in Scattering and tagged aseankorea, indonesia, nyepi, religion. Bookmark the permalink. Leave a comment.